Congregational Care, provided by members and congregational staff, comes in the attentive query or the one-to-one companioning or counseling. You can find out more about that here. Small Groups are an intentional group of people covenanting to meet once or twice a month through out the congregational year for deeper discussion and relationship-making. Group Activities, found here and here, happen for all ages, providing fun, fellowship and relationship-making, not only to each other but to the idea of River Road too. These activities and when they happen are present in both the emailed eWeekly and the Sunday bulletin found in the Order of Service. 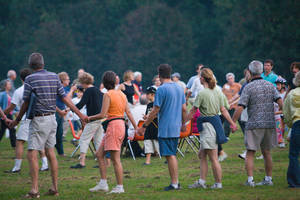 Congregational events are those times when the entirety of the congregation is called on to participate. Some of our major events are listed here. But there are more! Within RRUUC is a vibrant Fine Arts community that provides a place for congregant to experience beauty and ideas of those in the larger metro area and for congregants to share their gifts.